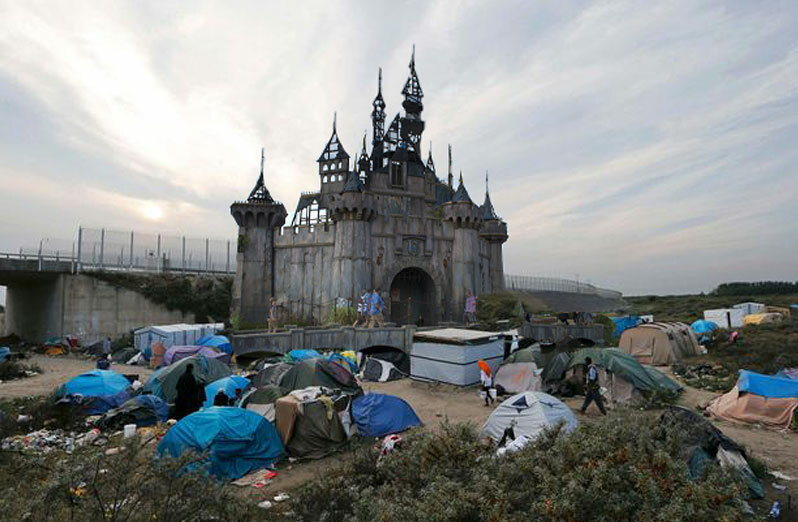 Tuesday 29th September 2015Dismaland to the Rescue? You'll no doubt recall our recent post on Banksy's latest installation project, a massive undertaking dubbed 'Dismaland', a riff on the famous American theme park Disneyland. The project ran for five weeks, from August 22 to Sept 26, and sold out it's 4000 available daily tickets every single day that it was in operation, an impressive feat in and of itself. Banksy apparently called the installation 'crap', but if anyone knows how quickly the public eats up his work, it's him. Now that the installation has run its course, however, there is a new plan in place for the remnants of the installation. It was incredibly large, though nowhere close to the size of the park it's cheekily mocking, and now Banksy finds himself in possession of a huge amount of raw building materials that can easily be repurposed. So what's a politically aware street artist to do? It turns out that he's willing to put his money where his mouth is, and has decided to dismantle the park and ship all the materials to Calais, France, where a huge number of migrants fleeing strife in the Middle East have congregated. The camp in Calais, known as The Jungle due its incredibly high rate of crime and terrible living conditions, is temporary home to an estimated 5,000 refugees at the moment, and that number is only likely to rise. It's a strange world we live in, where a mock theme park (a 'bemusement park', as Banksy put it) filled with anarchist training courses selling hacking kits run by a political activist artist is going to do more to help refugees than governments do. Admittedly, governments tend to have more hoops to go through, but that doesn't make the human cost any lower. Here's hoping that others will follow Banksy's good example and try to contribute what they can to alleviate people's suffering. Not that he's the only one helping, of course - many brave and compassionate volunteers around the world are helping every day without getting a whit of credit - but it's nice to see people continuing to step up to the plate.